As we prepare for our first ever Gate/Stoop/Yard Sale next weekend (mark your calendars 5/21/11) and continue to purge before packing - I wanted to pay homage to the small reminders left behind by the many roommates that have dwelled here at 392. This one is a favorite because I took the roommate's gift and turned it into - none other than.... Wall Art! This particular craigslist 6-month renter moved in right after accepting a demanding job in finance. She was by nature, quiet and stand-offish, but even so - she was never around. I called her the ghost roommate, and didn't mind her status at all. The rent was on the refrigerator by the 1st every month - so no complaints here! With her busy schedule she somehow found time to take a short weekend trip to visit friends in Tokyo, Japan. She returned and went directly to work Monday morning, leaving a gift for her favorite roommate! These were little boxes of adorable jelly bean candies and they were delicious! I opened the boxes up on the creases & realized there was anime artwork on every panel of these little boxes. 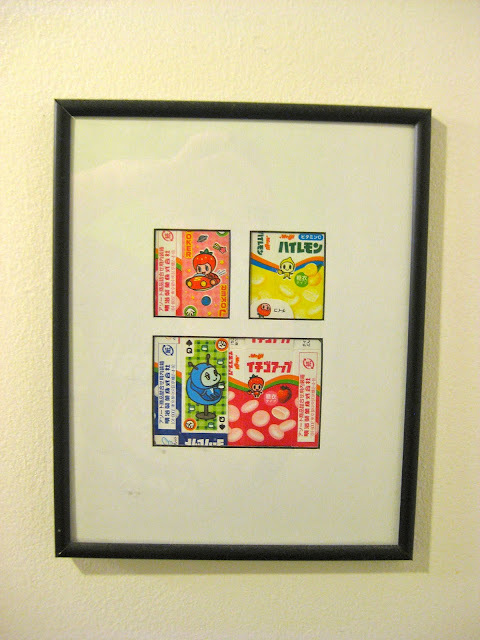 I had this frame with some random photos in it, so I took them out & made a little collage of Japanese candy art! It has hung in the bathroom ever since.